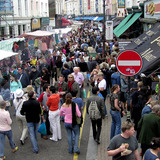 The daddy of London bazaars, Portobello Market is a melange of antiques, pubs, arcades and lively side streets. Immortalised by the film Notting Hill, it lives up to its lofty billing as the capital's premiere antiques market. On sheer size alone, it certainly demands a long afternoon of winding discovery along Portobello Road's two mile stretch. Taking place every Friday and Saturday, for those looking to beat the crowds and avoid the footfall, the smaller Friday market provides a much more manageable alternative to its bigger Saturday brother. And although its size might be a little compromised, the array of goods on offer is far from diminished. Up there with the world's biggest antiques markets, Portobello's antiques section is well renowned. A mere five minute walk from Notting Hill Gate underground station, expect to find a diverse selection of bric-a-brac, specialist stalls and dealers, and jewellery sellers. Follow the flow into a more than healthy fruit and vegetable section and enjoy the bubbling atmosphere with old-fashioned market characters, boisterous bargaining, fresh produce spilling out of wheelbarrows, and a regular throng of locals buying in supplies. Hang around late enough on the Saturday and you might even grab yourself a few tardy bargains. After the melee of the fruit and vegetable stalls, head along Talbot Road to the new goods section of the market where you'll find the general market traders and wholesalers. Here you can pick up everything from multi packs of socks to bulk bundles of batteries and household goods at typical market value. Somewhat less celebrated than the market's illustrious antiques area, and a little less concentrated, Portobello's fashion stalls are in increasingly rude health. Providing more than the obligatory t-shirt prints, it plays up to the influx of young, boho types in the area – second hand clothes stalls sit side-by-side with ambitious young designers looking to make a name for themselves. And should you have worked up a healthy appetite – you should have! – there are any number of gastro pubs, sandwich shops, pizza places, and cafes to grab a bite to eat on the move or rest those aching feet. Getting to Portobello Market couldn't be easier – either head straight to Notting Hill Gate Station and follow the crowd or hop on one of the many bus routes leaving from Victoria, Oxford Street and Kensington High Street. Why? Something old, something new, something borrowed. When: Fri - Sat 9am to 7pm.